For all their hype and availability in restaurants and kitchens across American, toothpicks aren’t the best option for cleaning those hard to get to spaces in your mouth. Most dentists advise against the use of toothpicks, knowing that the sharp wooden can cause damage to the oral cavity. They’ve been known to irritate the gingiva and scratch or fracture the enamel of your teeth. Instead, your dentist wants you to consider some other options for cleaning out the plaque and tartar that build-up between teeth and below the gum line where your brush bristles just can’t reach. Dental Floss is the dentists’ favorite because it’s the most effective. Sadly, it’s also the least utilized. The two minutes a day with this wax-covered string can make all the difference in your oral health. A plethora of studies have proven flosses worth, showing that its regular use in conjunction with brushing and seeing your dentist for cleanings several times each year, can greatly reduce the risk of gingivitis, periodontal disease, and tooth decay. The many varieties also make it versatile, offering cleanliness to teeth no matter their condition or position in the oral cavity. Got a twisted or crooked tooth? Teeth too close together? Gaps? No matter what, floss (and maybe some help from a floss threader) can get in there and clean food particles out. Floss sticks are another wonderful option, especially when you’re trying to make flossing easier for children. These are the sling shot shaped, plastic, disposable oral tools with floss strung between, and usually come in multi-packs. Colorful and molded options are also on the market to appeal to children. They are really handy to keep in purses or vehicle compartments. Just make sure that you throw them away when you use them so old bacteria doesn’t make its way back to your mouth. 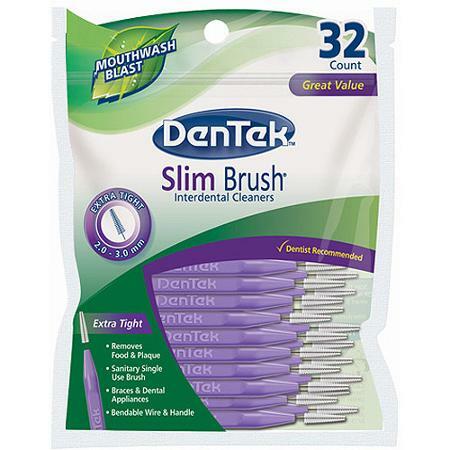 Proxy brushes are the super small, cone shaped brushes that can fit between teeth. They usually come in multi-packs, with rows of them attached. Pull one off and use it between teeth, below the gum line, and anywhere else you feel food stuck in your teeth. Their soft, flexible tip makes them easy to use. These are often given to patients that have orthodontic devices in their mouth to better clean around the intricate pieces. Interdental brushes are similar to proxy brushes, but with a longer handle like a tooth brush. They can come in all sizes, and sometimes have bristles rather than knobbed plastic tips. The heads of interdental brushes need to be changed periodically to avoid reintroducing bacteria to the mouth. Because of their size, interdental brushes are generally kept at home in the same holder as a toothbrush but work wonderfully to remove food particles and clean around orthodontic additions to your oral cavity. People with large hands or limited manual dexterity may find interdental brushes easier to use than dental floss. Water Piks, also known as an oral irrigator, are another wonderful option to remove food you can feel between teeth. The high pressure of water as it’s pumped through the device removes food particles and plaque almost as effectively as flossing. Additionally, studies have found that the water involved reduces gum inflammation and helps any oral sores or scratches heal faster. Water piks come in several varieties, from a hand help tankless one that attaches to the faucet to a countertop, water-filled appliance that can also be used for other cleanings such as jewelry. Check out this list of 2016 Top 5 Oral Irrigators decided by BestReviews.com. If you happen to be away from home or don’t have one of the above options on hand, there are some other items you can use in a certain way that can get the food particles out of your teeth without damaging them the way a toothpick can. Using the fingernails nature gave you is one option. However, be aware that they can irritate the gums if you slip and slice them. With this in mind, try to use the tip of your fingernail to pin the food in place against your teeth, and then pull the food away from your gum line. Another option that may seem a little weird is to use either a curled or folded tip of paper or corner of business card. Although you’d think you would get a paper cut, the moisture from your mouth will soft the product up just enough that it won’t hurt your mouth, but the strength of the paper or cardstock may be enough to get an irritating piece of food out from between your front teeth or molars. Lastly, thread may be a great alternative to toothpicks. Its small-yet-strong design will slip in between teeth as easily as thread, and shouldn’t fray or snap like normal string would. Use it the same way you would floss, gently wiggling it between teeth, under the gum line on both sides and along the sides of each tooth. The convenient of toothpicks has made them so popular, but dentists everywhere are encouraging patients not to use them. We hope you found the information above useful and will grab one of our recommendations the next time you need to remove that popcorn kernel or bit of meat from your teeth. Anytime you can reduce the risk of hurting your mouth, it’s a great idea to take advantage of it. Have you been flossing regularly?